Yesterday afternoon, I had an unusual conversation with a friend of mine. He invited me to his place where, in the back of his ute, he showed me a pallet of culled library school books from a primary school. He told me that his workplace decided to clean out their warehouse and found the pallet of books. How they got there, they weren't sure. But it was the first time they had cleaned the place out completely and decided to find out what was where. He was as amazed as I was (as well as his employers) to find the stash of books sitting there gathering dust. He said he offered to take some boxes off their hands; but when he found the entire pallet out side, he took them all, knowing they could be of better use somewhere else. And he knew that I knew where we could send them. I won't put in the name of the school here in case somebody knows or works there. It's a small town inland from Bundaberg, Maryborough and south of Rockhampton. However, I wondered how long these books had been sitting in my friend's workplace. 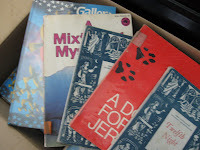 They had been boxed up and left there for goodness-knew how long! And the strange thing was: I remember learning to read from some of them at the Springwood Library. Oh! The memories of what I learnt to read was remarkable. I found the sight of some were amazing. However, a lot of these books weren't in the best of shape. This has caused me to wonder about exactly what schools do with their out of date books in their libraries. Do they cull them (which is something that does happen, unfortunately, as books do go out of date; as does the information in them) and them dump them in a warehouse somewhere instead of recycling them? Or do they send them off, trusting they'll be taken care of and the books end up where these ones have wound up? The fortunate thing about these books is I've decided to look into placing them somewhere. 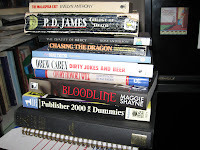 Being an avid Bookcrosser, I'll be registering some and hosting competitions on the site and giving them away. 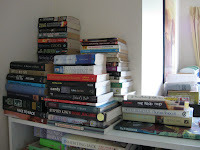 However, there will be books that I can't do that do; books that are too heavy to send off across the country - let alone across the miles - and so with those I'll be giving them to a worthy charity that will most definitely give them to people who do need them. 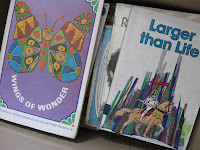 The strange thing I have found about these books is that the ones that were published just to entertain children were published by authors who have never written another book since that one. Yet, the educational books have had authors who were published again and again; then suddenly stopped as the children headed toward high school. It's been a real eye-opener as to how books in the past have been useful to a point, then very quickly not. But it does make you think about what happens to the books that are not sold at the Library Sales and the local and state libraries have to get rid of. I know some are recycled; but what happens the others that are boxed and shipped off somewhere? Do they end up in warehouses like my friend's works? Or do they end up where they are supposed to? Wherever that may be. Well, what do you know! I haven't bought any books this month! Wow! Now, talk about being good. Truthfully, I've been a little low on funds and have begun reading books from Mt TBR. So, instead of skipping this month, I thought to let you know what books I have gotten my nose into. The first book was the same one from holidays: 'Under The Dome' by Stephen King. It's a tome of a book and every time I get fifty pages read, it doesn't look much. So, I'm still kind of struggling with it. There is so much happening in it that I really do need to read some of it, put it down and digest it over a few days before getting back into it again. But I'm not bored with it. 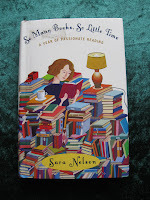 'So Many Books, So Little Time' by Sara Nelson is a lovely book I received for Christmas and I'm only just getting into it now. It's a book about reading books by a book reviewer from New York. I've done a review on it below as I'm enjoying it so much that I feel I didn't need to finish it before reviewing it... and I do feel the same way about books as she does; thankfully, I have a big collection like hers - just not 3,000 of them. My little office would never fit that many! 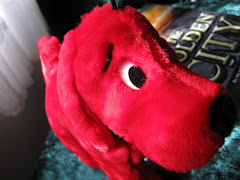 The next book was a bookring from Bookcrossing that I couldn't get into called 'The Book Thief' by Markus Zusak. It was simply because of when it was based: World War II, in Nazi Germany. There's just something about that time that really makes me choke. Otherwise the storyline is very sweet and lovely; how a little girl has a passion for words to the point that she steals her books to read. But it was where and when it was set that caused me to pass it to the next person. So, it's what I read this month instead of what I bought. But don't worry, I'll have a good look around next month to see what's available to purchase. I've just been good in not buying books this month; that's all. Sara is a book review and loves to read. However, she finds just reading the books and doing the reviews a little dull; and decides to set herself a challenge in 2000. As the year turns over and it's still freezing cold outside, she looks around her massive collection of books in her living room one night while everyone is asleep. She's trying to choose a book to take with her traveling. It's then this challenge strikes her as something that may be plausible: to read a book a week for a whole year. And this is what this book is all about. Seeing she does this very thing for a living it shouldn't be too hard - or is it? I was given this book for Christmas 2009. And I have found it the perfect book to read just before bed; as the chapters aren't too long, only a couple of pages to four pages long each. The amount of books she covers are amazing. There are some I haven't heard of and others I remember reading myself. Sara talks about experiences that have nothing to do with the books, but the content or the plot. And yet, this book is so well-written, I think I'll be keeping it for a time when I want to read it again and again. Sara Nelson is a senior contributing editor at Glamour and the publishing columnist for The New York Observer. she has been an editor at Self, Inside.com and Book Publishing Report and a contributor to many other publications including The New York Times and The Wall Street Journal. She lives in New York City with her husband and at least three thousand books. (The above it from the dust jacket of her book as I couldn't find all that much on the net about her. Sorry about that guys. I will keep searching for more information to add here and a site you can peruse at your leisure). Liesel Meminger is around ten years old when she's placed into a foster home in Nazi-Germany after the sudden death of her brother and the disappearance of her mother. At first, she hates being at this dull and uninspiring place where her foster mother is horrible, curses and swears a lot at her husband and treat Liesel terribly. However, there's Papa. The man who is cursed and sworn at by her foster mother. Papa's gentle and kind. He knows how to read - well, a little and very slowly. And this is the very thing that Liesel wishes to do when one night, after a horrible nightmare, Papa discovers that she had been hiding a book between the mattresses of her bed. So, in the late hours of the night, her lessons on reading begin; and so does the passion to read more. However, seeing how hard it is to find a good book to read, Liesel begins to steal them; her first one being from a Nazi book-burning one night. Then, she begins taking them from the mayor's wife's library and anywhere else she can find them. I was curious about this book when it first came out. However, I didn't rush out to purchase it because of when it was set; I didn't wish to own a book about a book thief set in this particular time in case I didn't feel comfortable about. 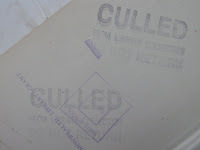 And when I received this one in the mail as a bookring from Bookcrossing I gave it a try; keeping an open mind to it. However, I could barely get halfway through this one. The story is brilliantly executed and I love the imagery, however, it's the time that it's set that I just can't get my head around. 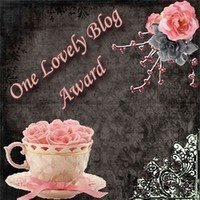 I've received another award! And I have Too Many Books, Too Little Time to thank for it. 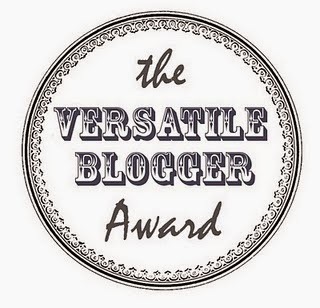 Seeing I've already awarded my share of bloggers with this award already. I think I'll just say thank you very much and let you all know I have received this one again. I still have it in the side bar too. I've been reading on a few other blogs lately (and yeah, I do follow quite a few based on reading and books), that the independent bookstores are being swallowed up and spat out by the bigger, more industrialised bookstores. I'm finding this terrible and a horrible waste of personal service. On the one hand, you have the wonderful little (and sometimes not-so-little) book stores that have been around since the beginning of time. They have regular customers, lovely people behind the counter who know the shop backwards in their sleep, books you wouldn't and couldn't find anywhere else around town and allow you to just meander around for as long as you want without asking if you need any assistance every ten minutes. Then, you have the huge, business building-sized bookstore you can get lost in at a moment's notice due to it's size; and not because you've lost track of time. They have lounge chairs everywhere, a coffee shop, people asking if you're okay and a computer system most people can't figure out on their own (thus the reason for these places to be overstaffed at times). It's not that I don't like the big, massive, book stores where you have to have map to find the section you want. But it's what these oversized stores do to the little business that really bothers me. Just like in the the movie, 'You've Got Mail', the small, community-based bookstore that had been around for more than 30+ years was shut down by the arrival of a huge, all you'd ever want to buy but better bookstore. The irony of this film - and I've found this with many bookstores that are on the larger scale - is that they lack the personal touch the smaller, independent bookstores have. In 'You've Got Mail', the owner of the smaller bookstore went into the bigger bookstore and found the staff knew nothing about the authors and the older editions of the books; but they knew all about the new publications. For some people, that's okay. But for collectors of books (like myself), that's not enough. 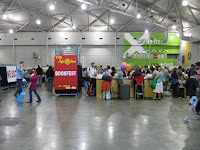 The independent bookstores are not becoming a thing of the past here in Australia. 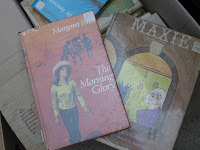 Seeing how we are finding it harder to make ends meet and it's not always best to purchase books brand new, us Australians often head off to the second-hand bookstores to find ourselves a bargain. Or better still, we wait until the bi-annual Life Line Bookfest in January and June where we can find books at the best prices ever! Last year, I bought up big there and even had enough money to buy some books for my niece who really loves horses. There are some great second-hand bookstores around the Brisbane area where their shelves are lined with books. 'Archive's Books' on Charlotte Street in the City is one. It's been around for years and people have gone there for years; I do recommend a visit there if you do come to this lovely city. Another I frequent is 'Cumquat Books' at Annerley; on the corner of Juliette Street and Emporer Street. It looks boring on the outside with its grey exterior; however once through that glass door, you'll never want to leave! And the best thing is: it's wheelchair friendly! Then, there's 'Charring Cross Books' at Chardon's Corner. It used to be in a house on Ipswich Road. But now, it's moved a few doors down next to the travel agent (ironically enough, not far from where it originally started off when I was in high school). But it's still there and just as popular as ever. So, has the independent bookstore you frequent been squeezed out of existence? Or is it still going strong? And how do you shop for books? Online or at a discount bookstore? 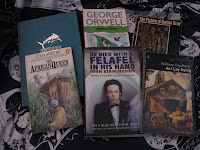 I do most of my shopping at second hand bookstores and charity shops as well as a place called QBD where their motto is: "Never pay full price!" That's a motto I do live by! When Danny Sugerman was thirteen years old, he attended his first Doors concert. He loved the music scene of L.A and was from a very privileged and wealthy family in Beverley Hills. However, behind closed doors, his family life sucked. After his father leaves because of his collection of frogs, snakes and lizards, his mother got a new boyfriend who hit Danny and made his life a living hell each time he came home. It got to a point when he just couldn't tolerate it and left; staying the night at the studios of The Doors where he worked as their fan mail handler. It was then Jim Morrison and the rest of the band found out what kind of hell he was going through. This is a funny and interesting look at how Danny's life comes a full circle only to end up right where he started; not knowing how he got there. The last time I read this book was in 2004. I remember buying and just flying through the book at a record speed. It took me along for the ride and I loved it. By the end, I wanted to read the other books; and fortunately, I had one of them ('The Doors: Illustrated History') which I received for my 19th birthday from my brother. Daniel Stephen Sugerman (aka Danny; October 11, 1954 – January 5, 2005) was the second manager of the Los Angeles based rock band The Doors, and wrote several books about Jim Morrison and The Doors, including No One Here Gets Out Alive co-authored with Jerry Hopkins, and the autobiography Wonderland Avenue. Sugerman replaced the original Doors manager, Bill Siddons, shortly after Morrison`s death in 1971. He helped film director Oliver Stone with the production of the 1991 movie The Doors. Sugerman began working with The Doors when he was 12 years old, starting with answering their fan mail. As stated by The Doors` drummer John Densmore, Danny was "the manager and driving force behind The Doors" who "guided our career for over 30 years". He lived his life keeping the legacy of The Doors alive. Sugerman was interested in working out a distribution deal with MP3.com for a number of live Doors recordings that were yet unreleased. No deal was forthcoming, and Sugerman later determined that it would be practical to offer the recordings on CD to fans via the Doors` own official website. Sugerman was a recovering heroin addict who found solace in Buddhism. He died on 5th, January, 2005 after a prolonged struggle with lung cancer due to years of smoking, and was interred in the Westwood Village Memorial Park Cemetery in Los Angeles.